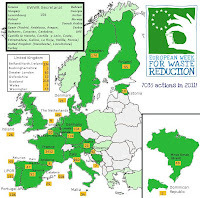 Sunday, November 27, was the last day of the third edition of the European Week for Waste Reduction, which has implemented more than 7.000 actions across Europe; once again Italy obtained the second place award with about 960 actions carried out around the country! In Italy, the media coverage for this edition has been especially remarkable due to numerous appearances on television and radio. There were three runs on “Striscia la Notizia”, by Cristina Gabetti, on “Canale 5”: Saturday, November 12, Saturday, November 19 and Saturday, November 26 (with an average of over 4 million viewers). Two runs on RAI3, one on Ambiente Italia and one on Chetempochefa with nearly 2 million viewers. In addition, several special episodes and interviews on local channels, radio, digital channels and online TVs. There have been also several publications on the press: e.g the Corriere della Sera. Even though the rain hasn’t stopped for some days during the “Week”, Project Developers haven’t been discouraged. In fact, even in those places where bad weather caused serious inconveniences, Organizers found the way to carry out planned initiatives, giving attesting the true passion of people who adhere to the "Week" and who make this yearly growing initiative possible. In June 2012, in Paris, the European Awards will be given to European most original and worthy actions, basing on the evaluations made by a panel of experts. The Italian Promoter Committee, composed by the Environment Ministry, Federambiente, Rifiuti 21 Network, Province of Turin, Province of Rome, Legambiente, AICA, E.R.I.C.A. and Eco dalle Città, expressed his gratitude to all the Project Developers who organized so many interesting and successful actions and also who participated in them.